Last night watching the opening ceremony, I was fascinated by the red costume worn by the women holding the signs bearing the names of each country. It's a modified version of the traditional Chinese chi-pao. 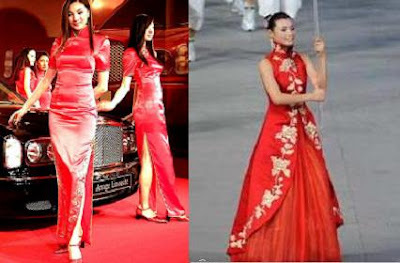 Instead of a slim fitting silhouette like the pic on left, the dress looks like a cross between an European court dress (on the bottom) and a traditional Chinese chi-pao on top. A friend from Shanghai took my measurements and had a chi-pao made for me a while ago. I have not had a chance to wear it yet but I think I will soon, just can't eat too much that day! There is no room for a bulging stomach from over indulging during a meal. A gal has great posture with chi-pao because I am focusing 100% on holding the stomach in, thus really straight spin!! i agree with the above statement. i have seen some interesting chinese RTW from different dynasties and they are gorgeous. i have a chi-pao that was made for me a few years ago.. i think i can still squeeze into it.. but it is definitely constricting! I loved the opening ceremony and the costumes as well!